Now that's what I'm talkin' about! Jenny front and center, Irving back in play and we finally met Mama Mills on Sleepy Hollow Season 2 Episode 9. Okay, I admit I missed Ichabod, but more importantly the silly love triangle was put on hold. If only it were on hold indefinitely. I enjoyed the team dynamic this week, including Hawley. How about you? Even Katrina in smaller doses worked. Is it possible the writers just hit upon the perfect formula for Sleepy Hollow Season 2? Will there be more episodes like this moving forward? I certainly hope so. The fact Ichabod had a cold allowed the writers to shift the focus to Abbie this week. I was totally fine with that, we needed a break from the Ichabod/Katrina arc. Abbie is a witness as well, and I feel like we've moved away from her story since Henry entered the picture. It was cool of Sheriff Reyes to give Abbie a case; maybe she's not so bad after all. Bringing Jenny along was a no brainer, though it must have been tough for her to return to Tarrytown Psych. Yes, that nurse seemed slightly out of place to me and that should have raised a red flag. Of course, it's easy to look back and say that. When I first watched it, I had no clue she'd turn out to be the big bad. Nice job writers! Spending some time with Irving was also long overdue. I've missed Frank, but it seems like we'll be seeing much more of him. Irving: My soul belongs to the Horseman of War, but for now I am still in control of my actions. Even chose my own color jello at breakfast this morning. Jenny: That's a good sign. Irving: I did this to protect my daughter and I'd make the same choice again if I had to. Abbie: We're gonna get you out of here. We'll find a way to undo whatever Henry did to your soul. Permalink: My soul belongs to the Horseman of War, but for now I am still in control of my actions. It's no wonder Jenny went down a darker path than her sister. Abbie's last memory of her mother was as an outpatient but Jenny watched orderlies drag their mother away. Not to mention she was almost killed in that locked car in their garage. I feel like I understand Jenny better now. How phenomenal was Aunjanue Ellis as Abbie and Jenny's mother? We've waited so long to meet this woman it was critical the actress deliver; and boy did she ever. I confess tearing up more than once this week. Hawley's presence didn't bother me in the least, which is rare lately. Watching Ichabod roll his eyes when Nick appeared was a trip. He seemed to love the Matzoh ball soup, but when he realized Hawley was pleased, he dropped it. I wonder if those two will ever get along. Nick seems to have softened a bit toward Ichabod but Crane is holding out. Either way, their dynamic is fun. Ichabod: Tarrytown hospital is built on a specific ley line that points of convergence between us and the spirit world. Ichabod: He might have conjured her to pray upon our resolve. Permalink: He might have conjured her to pray upon our resolve. Sure, Ichabod wasn't feeling well, but the way he gets all defensive when it comes to Katrina is irritating. I was actually glad the soup knocked Mr. Woodhouse (as Nick referred to him) out. Chill Shakespeare, dang. Yep I love Hawley's nicknames for Crane. Speaking of Katrina, I realize Henry was manipulating her but I'm beyond disappointed she fell for it. Kat knows that's freaking Moloch; why touch the thing? I don't get it. By the way, the writers should trust we have the attention span to follow the storyline. It was annoying they felt the need to flash back to the jar, the demon baby and Kat's enchanted necklace. Were we treated as this clueless last season? It seems you possess the maternal instinct after all. Permalink: It seems you possess the maternal instinct after all. At Tarrytown Psych, Abbie was teleported to an abandoned section of the hospital. How did that happen exactly? Her mother must be one powerful ghost if she managed that. Or was it the nurse? When nurse Lambert appeared for a second time, I knew for sure something was up with her. Mama's spirit leads the sisters to an old video recording. It all came together way too conveniently, but I moved past that fact easily enough since Irving was the next victim. It all happened so quickly I just went along with it. Jane Lambert claimed the lives of twenty one patients across the country while working as a nurse back in the 1950s. There was tons of exposition about the nurse and the fact she was finally caught at Tarrytown and sentenced to the electric chair. Somehow, when the characters read the information to us it works for me. It feels organic, though not always necessary. The creepy old wing is also where Mama Mills' cell was located. The hidden drawing of the girls they uncovered was chilling, as was the musical score in the scene. I'll be honest, I had forgotten about the connection between Grace Dixon (Abbie/Jenny's ancestor), Frederick's Manor and the Cranes. I'll forgive the previous flashback since this one did help refresh my memory. I thought it was clever that the journal belonged to Grace. Can you imagine how difficult it must have been to meet the "angel of death" responsible for taking your mother? In a twisted way, it's comforting to realize Lori Mills was manipulated into killing herself. Mama Mills and the evil nurse fought it out while Jenny performed an incantation that ultimately sent the nasty spirit back to hell; good riddance. It was great that Ichabod was present when they summoned Mama Mills. One minute I'm laughing as Crane and Hawley reluctantly hold hands and the next I'm tearing up when Lori Mills appears. Terrific performances all around as we learned Mama always fought to save her girls. Lori: I did. After they locked me up Moloch sent her to finish me off. I've been trapped in this place ever since. I watched over you Jenny, while you were here. I did everything I could to protect you both. This installment helped to finally bring the Mills sisters closer together. They now understand the truth about what happened to their mother while at Tarrytown Psych. Lori Mills also left them their first bona fide weapon against Moloch; the journal. Irving escaping puts him back in the game which absolutely thrills me. It seems like Sleepy Hollow should be back on track in the second half. Moloch is growing alarmingly fast which can't be good. I doubt the showrunners could have picked a cuter kid for Moloch. Hopefully he's a total brat so Katrina doesn't forget who she's dealing with. Wonder what the demon version looks like... Eeeek! What did you think of "Mama"? Is there any chance we'll see Lori Mills again or has her spirit moved on? Is Katrina's infection nurturing Moloch? Your turn Sleepyheads, hit the comments below and share your thoughts with me. Look for our Sleepy Hollow round table later this week. 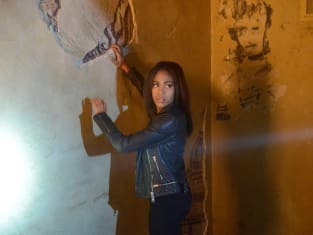 As always if you'd like to re-watch an episode or missed one remember you can watch Sleepy Hollow online via TV Fanatic.